This text was published in Journal of Geography, Environment and Earth Science International 9(4): 1-6; article nr. JGEESI.32198. The year 2016 CE marked the centennial of palynology as a scientific discipline after Lennart von Post introduced it in lectures in Kristiania (now Oslo) and Stockholm in 1916. However, palynology is only one of many disciplines within the broad field of palaeoecology. The 100th birthday of palynology raised the question of when palaeoecological research was actually conducted for the first time. The first rudimentary application seems to go back to Xenophanes of Colophon (circa 570-475 BCE), who concluded from observations of shells and marine fossils on lands that these in the past must have been covered by a sea. Although the exact date when Xenophanes formulated his ideas is unknown, celebration of another milestone after the Von Post year may be appropriate: that of 2500 years of palaeoecology. 2016 was the 100th anniversary of the famous lectures that the Swedish geologist Lennart von Post gave in Kristiania (now Oslo) at a conference between July 10th-15th 1916, and in Stockholm on November 2nd of the same year [1-4]. Generally, these lectures are considered to represent the birth of palynology as a scientific discipline. In 1916 also pollen diagrams were published for the first time . Palynology, however, is only one of many disciplines within the broad field of palaeoecology. Palaeoecology is the “study and understanding of the relationships between past organisms and the environment in which they lived”, or more practically “the reconstruction of past ecosystems” . Normally in modern-day science the past environment is reconstructed from a variety of proxies, including the study of plant macrofossils, algae, rhizopods, molluscs, ostracods, Cladocera, chironomids, Coleoptera, vertebrates, and many more [6-8]. Apart from biological entities, even various abiotical parameter - among others geochemistry and sedimentation processes - are used to characterise past ecosystems . Palaeoecology developed slowly in the course of time until the first modern palaeoecological studies were performed in the mid of the 19th century . The centennial of palynology raised the question when the first true palaeoecological research was undertaken, or in other words: when was the first time that fossils were used for the reconstruction of a past environment. 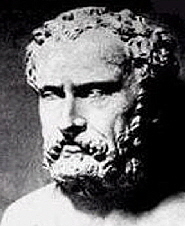 The earliest work seems to be that of Xenophanes of Colophon (circa 570–475 BCE), of whom the name and works are largely and unfortunately forgotten by present-day earth scientists. Therefore, this paper commemorates Xenophanes and the beginning of palaeoecology. People have always wondered about how the world around them came into being, and how it developed and functioned. This is testified by an enormous amount of legends on the creation of the world, and about gods and goddesses who controlled the sun, moon, thunder and lightning, floods and droughts, earthquakes, volcanic eruptions, diseases, and so on [9,10]. As early as the Palaeolithic, cave paintings from all over the world indicate a keen awareness of the natural environment . It was necessary to know all about the habits of prey animals, to know which plants were nutritious and which were poisonous, how to heal injuries, how to make fire, how to make and use tools, and later also to know the techniques of agriculture and metal production . Many prehistoric objects and monuments having an astronomical intention as well as numerous mathematical and calendrical concepts of ancient societies illustrate great skill in understanding the natural world [10,12-17]. But in a world-view dominated by gods there is a mixture between the natural and the supernatural, which needed to become separated before proper science could develop [10,16,18]. The first true science is generally attributed to ancient Greeks around the 6th and 5th centuries BCE . Their works on mathematics, physics, astronomy, geography, botany and medicine, in particular, are renowned and highly regarded [10,13,19,20]. Geological and geomorphological processes were regularly addressed by antique writers and sometimes show a remarkable understanding of the underlying processes . Fossils were well-known in Antiquity and before, but not always recognised as such. Fossils attracted tourists and collectors, and were displayed in temples, shrines and tombs [21-26]. Nowadays in many cases where fossils were found in such archaeological settings the archaeologists did not consult palaeontologists , which inhibited understanding of the meaning of fossils for ancient people. Little is known of the life of Xenophanes [13,19,27; Fig. 1]. According to these sources, that base predominantly on a short biography from the third century CE by Diogenes Laertius in “Lives of eminent philosophers” (9.18-20) , he was born around 570 BCE, and died at an extremely old age around 478–475 BCE. He left his home-town of Colophon (Ionia, present-day western Turkey) at the age of 25, probably because of a Persian invasion in the region. He wandered through the Greek world for some 70 years and is known to have lived in Ionian colonies on Sicily and the Italian mainland. Much of his work has been lost, and his ideas are predominantly known through citations by other authors. It has been transmitted that he wrote on the histories of Colophon and Elea, poetry, and that he criticised especially the theological visions of Homer and Hesiod. He wrote elaborately on his own religious views that were mainly of a pandeistic character as opposed to the dominant worshiping of multiple anthropomorphic gods of his times. 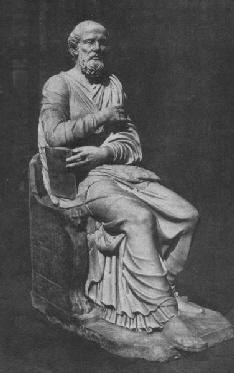 Figure 1: Sculpture generally assumed to depict Xenophanes of Colophon. It was not possible to trace where it is currently located, or to verify whether it in fact depicts Xenophanes: according to  no sculptures of Xenophanes have been preserved. Source for the picture: https://ru.wikisource.org/wiki/%D0%A4%D0%B0%D0%B9%D0%BB:Xenophanes.jpg, which claims that the picture is in the public domain (accessed March 30th, 2017). One of Xenophanes’s work was “on nature”, which is summarised in the “Refutation of all Heresies” (1.14.5-6) by Hippolytus of Rome (170-235 CE; Fig. 2) . This work was intended as an inventory of various pagan and Christian ideas that Hippolytus rejected at a time when official Christian doctrine was still developing. Copies of the original work were probably still available for scholars in the time of Hippolytus and will have been lost afterwards: it is evident from his text that Diogenes Laertius had access to (some of the) complete writings of Xenophanes . Hippolytus wrote about the ‘heretic’ ideas of Xenophanes: “This man postulates that the sea is salt because many mixtures flow into it [i.e. water and sediments transported by rivers]. (…) And Xenophanes thinks that there is a mixing of earth and sea, and that the earth interchanges with sea [i.e. the dry lands were regularly completely flooded, after which dry grounds developed again]. He claims to have the following evidence: in the centre of lands and in mountains shells occur. And he mentions that imprints of a fish and of seals were found in quarries in Syracuse, that on Paros the imprint of a laurel was discovered deep in rock, and that on Malta remains of all kinds of marine animals were present. He states that this is because these objects were embedded in mud and that the imprint was preserved when the mud dried. All humans perish when the earth is washed-away into the sea and transformed into mud. Afterwards, however, the earth forms again which is the origin for all lands” (modified after a German translation ). Figure 2: Statue probably depicting Hippolytus of Rome from the 4th or 5th century CE. The sculpture was found in 1551 at the Via Tiburtina in Rome and is currently exhibited at the Vatican library. Source for the picture: https://commons.wikimedia.org/wiki/File:HippolytusStatue.JPG#/media/File:HippolytusStatue.JPG, which claims that the picture is in the public domain (accessed March 30th, 2017). The reference to an imprint of a laurel is enigmatic, since this is not an evidence that a sea previously covered that area. According to Bromehead the translation is erroneous and Xenophanes had actually meant imprints of sprats . He even mentioned that in various translations reference is made to the imprint of an anchor, which does not make sense at all for the time-period of Xenophanes when anchors consisted of large heavy stones attached to ropes: an imprint of a stone in a stone is just highly illogical . It is interesting that – although written in Latin instead of Greek - Ovid (43 BCE–17 CE) also mentioned the occurrence of an anchor in the mountains which he used as evidence—together with observations of shells—for the persistence of a former sea (“Metamorphoses” 15.259-267) ; perhaps he made a similar error when reading Greek texts which he used as sources. The work of Xenophanes is the oldest-known example in which observed fossils were used to deduce a palaeoenvironment, and – although still rudimentary – marks the first application of palaeoecology. However, since the original work is lost and was only transmitted to us in the work by Hippolytus written some 700 years later, it is difficult to estimate how widespread such views were, and whether Xenophanes was the original author or whether he only repeated views developed by others: Burnet posed that the fossils may have been actually observed by Anaximander (circa 610-546 BCE) who may have been a teacher of Xenophanes , but there is no evidence for this assumption. Herodotus (Fig. 3) wrote around 440 BCE in his “Histories” (2.11-12) that Egypt was a sea once, and also mentioned as evidence the occurrence of shells in mountains . Xanthus of Lydia (480–440 BCE) and Eratosthenes of Cyrene (circa 276–195 BCE), both quoted by Strabo (circa 64/63 BCE–24 CE), came to the same conclusion for various regions (“Geographica” 1.3.4) . Later Strabo also drew this conclusion for Libya (“Geographica” 17.3.11) . Plutarch (80–120 CE) stated that Egypt once was a sea based on many finds of shells in mountains and quarries (“On Isis and Osiris” 40) . Furthermore, Pausanias (circa 110–180 CE; “Description of Greece” 1.44.7) wrote about calcareous rock in Megara that included many seashells . All these examples postdate Xenophanes. These authors may have known of the work of Xenophanes, but perhaps they also drew the same conclusion themselves. Although several modern scholars praise the great insights of ancient palaeoecologists [12,20], Rudwick points out that interpreting the existence of a former sea from occurrences of shells is very easy and did not require much scientific understanding . 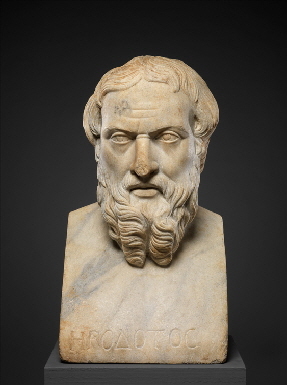 Figure 3: Portrait of Herodotus, Roman copy from the 2nd century CE of a Greek original of the early 4th century BCE, displayed at the Metropolitan Museum of Art, New York. The sculpture was found shortly before 1891 in Banha (Egypt) . Source for the picture: http://www.metmuseum.org/art/collection/search/245829, which claims that the picture is in the public domain (accessed March 30th, 2017). It is an important notion for the history of earth sciences in general, and for the history of palaeoecology in particular, that people during early times were careful observers of their world, and that they thought about the natural background of their environment. Thus, ‘earth sciences’ in a broad sense have a long and rich history dating back to Antiquity and prehistory. Xenophanes developed a new way of thinking about the past environment using observations from the field, and so he laid the foundation for a valuable scientific discipline that developed over time along various pathways into modern palaeoecology . We do not know in what year Xenophanes wrote his work; the present year (2017 CE) is 2586 years after his assumed birth and 2491 years after his alleged death (omitting the non-existing year 0). Assuming that he did not write his work prior to leaving Colophon at the age of 25, then palaeoecology rose between 2561-2491 years ago. It seems, therefore, appropriate after the 100th birthday of pollen analysis to commemorate another milestone: that of 2500 years of palaeoecology. I want to thank John Diemer for numerous linguistic corrections, and six reviewers for valuable comments on the text. 1. Anonymous (1916): Mötet den 2 november 1916. Geologiska Förenings I Stockholm Förhandlingar 38: 383–394. 2. Von Post, L. (1918): Skogsträdpollen i sydsvenska torvmosselagerföljder. In: Anonymous (ed): Forhandlinger ved de Skandinaviske Naturforskeres 16. Møte i Kristiania den 10.-15. Juli 1916: 433–468. 3. Von Post, L. (1967): Forest tree pollen in south Swedish peat bog deposits. Pollen et Spores 9: 375–401. 4. Nordlund, C. (2014): Peat bogs as geological archives: Lennart von Post et al., and the development of quantitative pollen analysis during World War I. Earth Sciences History 33: 187-200. 5. Von Post, L. (1916): Einige südschwedischen Quellmoore. Bulletin of the Geological Institution of the University of Upsala 15: 219–278. 6. Birks, H.J.B., Birks, H.H. (1980): Quaternary Palaeoecology. London: Edward Arnold. 7. Berglund, B.E. (ed.) (1986): Handbook of Holocene Palaeoecology and Palaeohydrology. Chichester: Wiley. 8. Cloud, P.E. (1959): Paleoecology – retrospect and prospect. Journal of Paleontology 33: 926-962. 9. Kirk, G.S. (1980): Griechische Mythen – Ihre Bedeutung und Funktion. Berlin: Medusa-Verlag. 10. Lindberg, D.C. (1994): Von Babylon bis Bestiarium. Die Anfänge des Abendländischen Wissens. Stuttgart: Metzler. 11. Guthrie, R.D. (2005): The Nature of Paleolithic Art. Chicago: The University of Chicago Press. 12. Aaboe, A. (2001): Episodes from the Early History of Astronomy. New York: Springer. 13. Kirk, G.S., Raven, J.E., Schofield, M. (2001): Die vorsokratischen Philosophen. Einführung, Texte und Kommentare. Stuttgart: Metzler. German. 14. Ruggles, C., Cotte, M. (eds) (2010): Heritage Sites of Astronomy and Archaeoastronomy in the Context of the UNESCO World Heritage Convention. Paris: Icomos/International Astronomical Union. 15. Imhausen, A. (2013:. Science, Egyptian. In: Bagnall, R.S., Brodersen, K., Champion, C.B., Erskine, A., Huebner, S.R. (eds. ): The Encyclopedia of Ancient History, Volume XI: Ro-Te, Chichester: Wiley-Blackwell: 6065-6066. 16. Ossendrijver, M. (2013): Science, Mesopotamian. In: Bagnall, R.S., Brodersen, K., Champion, C.B., Erskine, A., Huebner, S.R. (eds. ): The Encyclopedia of Ancient History, Volume XI: Ro-Te, Chichester: Wiley-Blackwell: 6070–6072. 17. Steele, J.M. (2013): Sciences, Exact. In: Bagnall, R.S., Brodersen, K., Champion, C.B., Erskine, A., Huebner, S.R. (eds. ): The Encyclopedia of Ancient History, Volume XI: Ro-Te, Chichester: Wiley-Blackwell; 2013: 2075-2076. 18. Gregory, A. (2007): Ancient Greece and the origins of science. In: Close, E., Tsianikas M, Couvalis G, editors. Greek Research in Australia: Proceedings of the Sixth Biennial International Conference of Greek Studies, Flinders University June 2005. Adelaide: Flinders University, Department of Languages - Modern Greek: 1-10. 19. Keyser, P., Irbie-Massie, G. (2008): The Encyclopedia of Ancient Natural Scientists. The Greek Tradition and Its Many Heirs. Oxon: Routledge. 20. Keyser, P. (2013): Science, Greek. In: Bagnall, R.S., Brodersen, K., Champion, C.B., Erskine, A., Huebner, S.R. (eds. ): The Encyclopedia of Ancient History, Volume XI: Ro-Te. Chichester: Wiley-Blackwell: 6066-6070. 21. Bromehead, C.E.N. (1945): Geology in embryo (up to 1600 A.D.). Proceedings of the Geologists Association 56: 89–134. 22. Mayor, A. (2000): The first fossil hunters. Paleontology in Greek and Roman times. Princeton: Princeton University Press. 23. Mayor, A. (2007): Place names describing fossils in oral traditions. Geological Society of London, Special Publications 273: 245–261. 24. Mayor, A. (2013): Fossils. In: Bagnall, R.S., Brodersen, K., Champion, C.B., Erskine, A., Huebner, S.R. (eds. ): The Encyclopedia of Ancient History, Volume V: Ec-Ge. Chichester: Wiley-Blackwell: 2747-2748. 25. Solounias, N., Mayor, A. (2004): Ancient references to the fossils from the land of Pythagoras. Earth Sciences History 23: 283–296. 26. Kyrieleis, H. (1988): Offerings of the ‘common man’ in the Heraion at Samos. Skrifter Utgivna av Svenska Institutet I Athen Series 4 38: 215–221. 27. Gemelli Marciano, M.L. (2007): Die Vorsokratiker. Band 1: Thales, Anaximander, Anaximenes, Pythagoras und die Pythagoreer, Xenophanes, Heraklit. Düsseldorf: Artemis & Winkler. 28. Diogenes Laertius (Διογένης Λαέρτιος): Βίοι καὶ γνῶμαι τῶν ἐν φιλοσοφίᾳ εὐδοκιμησάντων. Translated by Hicks, R.D. (1925): Lives of eminent philosophers. London: William Heinemann. 29. Hippolytus of Rome (Ἱππόλυτος): Κατὰ πασῶν αἱρέσεων ἔλεγχος. Paragraph on Xenophanes translated in . 30. Ovid (Publius Ovidius Naso): Metamorphoseon libri. Translated by Fink, G. (2004): Metamorphosen. Düsseldorf: Artemis & Winkler. 31. Burnet, J. (1908): Early greek philosophy, second edition. London: Adam and Charles Black. 32. Herodotus (Ἡρόδοτος): Ἱστορίαι. Translated by Waterfield, R. (1998): The Histories. Oxford: Oxford University Press. 33. Strabo (Στράβων): Γεωγραφικά. Translated by Forbiger, A. (2005): Geographica. Wiesbaden: Marix Verlag. 34. Plutarch (Πλούταρχος/Lucius Mestrius Plutarchus): Περι Ισιδοσ και Οσιριδοσ. Translated by Görgermanns, H. (2009): Drei religionsphilosophische Schriften: Über den Aberglauben, Über die späte Strafe der Gottheit, Über Isis und Osiris. Düsseldorf: Artemis & Winkler. 35. Pausanias (Παυσανίας): Ἑλλάδος περιήγησις. Translated by Meyer, E. (1986): Reisen in Griechenland Band I: Athen, Bücher I-IV Attika – Argolis – Lakonien – Messenien. Zürich: Artemis Verlag. 36. Rudwick, M.J.S. (1976): The meaning of fossils. Episodes in the history of palaeontology. Chicago: University of Chicago Press. 37. Zanker, P. (2016): Roman portraits. Sculptures in stone and bronze in the collection of the Metropolitan Museum of Art. New York: Metropolitan Museum of Art. 38. Höffe, O. (2001): Kleine Geschichte der Philosophie. München: Verlag C.H. Beck.